with both feet and firmly depress it. Do not pump the brake pedal repeatedly as this will increase the effort required to slow the vehicle. 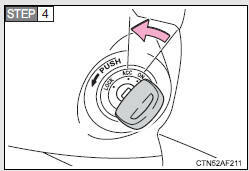 Shift the shift lever to N.
in a safe place by the road. with both feet to reduce vehicle speed as much as possible. Vehicles without a smart key system: Stop the engine by turning the engine switch to the “ACC” position. 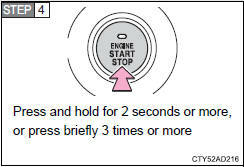 To stop the engine, press and hold the “ENGINE START STOP” switch for 2 consecutive seconds or more, or press it briefly 3 times or more in succession. • Power assist for the brakes and steering wheel will be lost, making the brake pedal harder to depress and the steering wheel heavier to turn. Decelerate as much as possible before turning off the engine. • Vehicles without a smart key system: Never attempt to remove the key, as doing so will lock the steering wheel.